Hi, I am interested in your 1989 Mercedes-Benz 560SL (stock #5084-CHA) listed on Autotrader for $23,995. I'd like to get more information about this vehicle and confirm its availability. Its hard to believe but true. 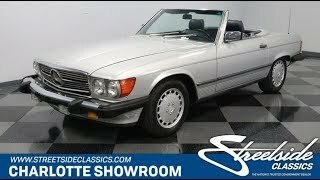 This classic 1989 Mercedes 560SL is in the in an exceptionally well-preserved, finished in its ideal factory color combo, has two tops, and its original powerful V8... and yet you dont have to pay over $26k to join high society. Mercedes built these R107 SLs correct from day one, and so if you find a well-preserved example like this one, age is barely a factor. Super straight sheetmetal, complete trim, and Teutonic precision in the gaps tell you that youre looking at a proper classic Mercedes. The factory-applied Astral Silver metallic paint is still a stunner when the sunlight hits it. Plus, the color matches the silver wheels, and its one of the few colors from the era that still looks modernly elegant today. That gives this a timeless elegance, and thats important in a classic Mercedes. After all, when you show up to the country club, and everyone sees the blue pinstripe that matches both the blue top and the blue interior, they will be too impressed to bother asking how much you paid. One of the best complements to the exterior paint is the interior color. Whether people see you on sunny days with the optional blue leather, or even when the blue fabric top is up, both of these highlight the kind of corresponding colors that are still being utilized by the finest carmakers today. Beyond just the perfect hues, this Mercedes is desirable because theres plenty of evidence of a pampered life. The carpets, dashboard, and wood grain center console basically show no signs of sun damage a near impossible find in a classic droptop. The 560SL was one of the most expensive cars Mercedes offered during its reign, so the features list is quite long. This includes conveniences such as air conditioning, power windows, power locks, power steering, cruise control, and an upgraded AM/FM/CD stereo. Because this was built 1989, there are also more modern safety features than most R107s, such as anti-lock brakes, a third brake light, and a drivers air bag. The 560SL came with a big 5.6-liter V8 motor making 238 hp and 287 lb-ft of torque more than the estimated power of a contemporary Rolls-Royce. On the road, an R107 has a fully-independent chassis that is the perfect balance of elastic comfort in a tight-handling package. This was topped of with a four-speed automatic transmission and four-wheel disc brakes for the best all-around control. In total, the Mercedes SL is in a class all of its own. It has always been hard to define its competitors because no other car combines grand touring comfort in a quick and nimble machine so perfectly. This timeless classic proves its worth in the full file that comes with it, which includes the original window sticker, bill of sale, title docs, and maintenance records. Its the superior classic that begs for the long way home and can carry all the luggage for a weekend getaway. A full wish list car like this is a great way to teat yourself, so grab a bit of the good life at a great price. Call now! !